Interestingly, India, China and the USA hadn’t changed much compared to 2012. Their ranks were in the 53rd, 45th, and 11 percentiles respectively. Their scores had hardly budged from the previous year. 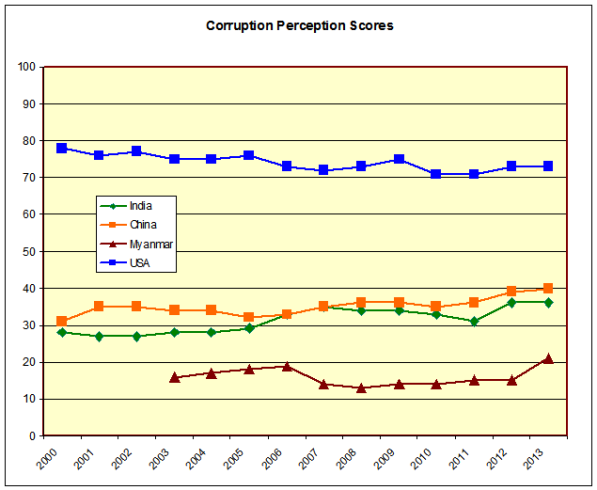 I’ll be very interested to see if the new government in India significantly affects corruption perceptions in the next survey. Meanwhile, in the 2013 survey, the big surprise was Myanmar. 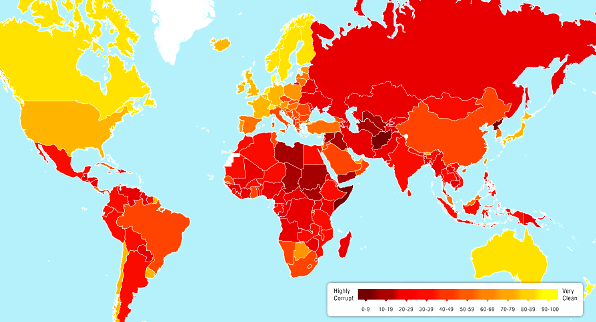 In 2012, its rank was dismal – in the 98th percentile, it was among the worst in the world. This time, it was still dismal, but had improved distinctly, bringing it to the 89th percentile. Its score had risen from 15 to 21 between 2012 and 2013, while India remained flat at 36, the US flat at 73, and China moved only one point from 39 to 40. While a normalized rank of 89 is nothing to brag about, the improvement is. If Myanmar can keep this up for a few years, people will be able to dismiss corruption there as no worse than anywhere in ASEAN. This entry was posted in Asia, Doing Business in India and tagged Burma, China, corruption, Doing Business in India, myanmar. Bookmark the permalink.